Learn all you need to know about our Greenport hotel before making a reservation. We aim to provide you with the best North Fork experience. If you have any further questions after reviewing our FAQs, please feel free to contact our hotel in Greenport directly. What is your policy on reservation confirmation, deposit and guarantee? Upon completion of a reservation, a confirmation number is supplied to the guest via telephone, email and/or standard mail. A deposit of one night’s stay plus applicable taxes is required to make a reservation. Rooms are guaranteed for the first night upon receipt of the advanced deposit. Cancellations made more than three weeks prior to arrival receive a full refund of deposit. Cancellations made within three weeks of arrival will result in a forfeiture of deposit. We strongly encourage guests to purchase trip cancellation/protection insurance to cover pre-paid and non-refundable deposits and expenses in the event guests need to cancel or modify their reservation inside the 21 day cancellation window or otherwise arrive late or depart early due to family emergency, illness, inclement weather, travel issues, or any other conditions that may prevent staying at the Harborfront Inn on all dates reserved. How can I inquire about rates? North Fork hotel rates fluctuate throughout the year depending on the season and special package rates are often offered. All rates are subject to applicable local and state taxes and are subject to change without notice. How can I check availability and are there minimum stays? Available rooms may be reserved via telephone or through the hotel’s online booking system. If rooms are not available online, we suggest that guests contact a reservationist for further assistance. As rooms book quickly at the Harborfront Inn, it is advised that guests make arrangements as early as possible to stay at the hotel. A three-night minimum stay will apply over President’s Day Weekend, Memorial Day weekend, July 4th weekend, Labor Day weekend, Maritime Festival weekend and Columbus Day weekend. A two-night minimum stay will apply over all weekends. A three-night minimum stay will apply over all weekends in July and August. Do you allow early check-in/late check-out? Early check-ins and late check-outs cannot be guaranteed; however, requests for an early check-in or late check-out will be noted by a reservationist and every effort is given to fulfill these requests. Based upon availability, late check-outs may also be arranged for an additional fee. What is your policy on payments and other charges? The Harborfront Inn accepts Visa, MasterCard, American Express, Discover and Diner’s Club. The Inn also accepts cash and traveler’s checks, but does not accept personal checks. After the initial deposit is taken at reservation, the remaining room balance is due upon departure. There are other charges that may appear on a guest’s bill after check-out and charges may also be assessed if hotel property is missing or for damage to a room. Do you offer facilities for guests with disabilities? The Harborfront Inn offers two handicapped-accessible rooms, which are conveniently located on the second floor within close proximity to the elevator. Handicapped-accessible rooms offer a tub/shower combination with guides and handrails. The restroom and closet also allow for wheelchair accessibility. Unfortunately, the Harborfront Inn does not allow guests to bring pets to the hotel at this time. 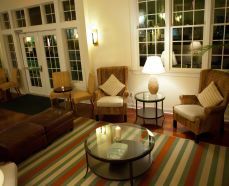 The Harborfront Inn does not offer an on-site restaurant, but the hotel is in easy walking distance to many fine dining establishments in Greenport Village. The hotel does offer a complimentary Continental breakfast for guests every morning. The Harborfront Inn does not have an on-site spa facility, but in-room spa treatments can easily be arranged through the front desk with advanced notice. Do you have guest parking available? Yes. However, please note that on-site parking is limited. Do not be alarmed if during peak periods you are not able to find a spot in our lot. There is additional available parking on the north side of Front Street in the Adams Street municipal parking lot, just 50 yards from our entrance.